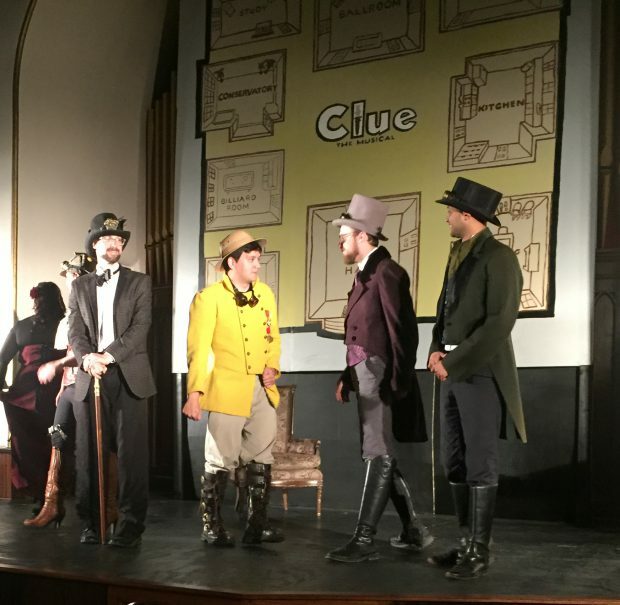 Last week, I had the pleasure of being one of the attendees for opening night of the community theater production of Clue: The Musical at the Palisades Playhouse in Greenfield. If you are looking for something to do this weekend, I would like to suggest that you make time to go see one of the final performances. This performance is definitely kid friendly and a good way to entertain the family on a holiday weekend. One of the things I learned when I would give a weekly event listing on WDVE is that there are often no event happening on holiday weekends. The lack of events for holidays is problematic, because if your family is like my family, we can only exist in peace when we are doing something together. I was just thinking about the easter when I was little and my grandparents came to visit, in an effort to keep everyone entertained we went to visit a chicken farm somewhere in Westmoreland County, I think (I assure you my father will read this post and fact check the location). I will admit that I am quite biased in my support of this particular production, 1/4 of the cast are good friends of mine from high school, but my friends aside, here are 5 reasons I think you should check out Clue: The Musical this weekend. Clue: The Musical. I loved and still love Clue: The Movie. I remember first watching this at my friend Mandy’s sleepover birthday party and as seven year-olds, we thought the scene where the signing telegram woman collapses was the funniest thing ever. I had no idea there was a musical version of what I consider to be a cinematic classic. Clue: The Musical is still a mystery and still the same clever plot line but with some snappy songs for a stage production. Sadly the singing telegram is not included in the musical version. A musical & a mystery you try to solve. I’ll get back to the snappy songs in a second. I thought that I was going to see a series of musical performances, what I did not expect and really loved about the production is that is also a mystery. 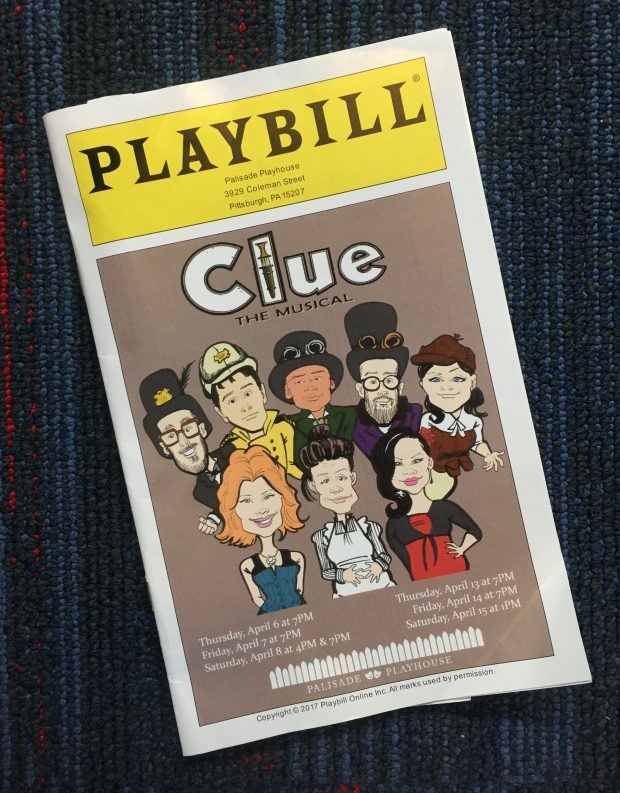 Your program comes with a score card and you can keep track of the clues that are presented by the characters as the show unfolds. The cast & crew. I have tremendous respect for anyone who gets on stage and performs. The entire cast is performing for fun, rehearsing after their full-time jobs. The set. I thought that the Palisades Playhouse did an incredible job creating a backdrop for the performance. Minimal, but well constructed and supported the overall plot of the musical performance. The theater building. I was particularly excited to see this production and check out how the Palisades Playhouse was re-purposing the former Greenfield Presbyterian Church building. Last month, Partners for Sacred Spaces, a national nonprofit with the mission of helping churches and communities reuse religious structures spoke here in Pittsburgh. One of the many examples of church reuse that they shared was for community theater spaces. It was great to see how Palisades Playhouse is using the sanctuary as a theater and hear more about how the other areas of the building are being used as community spaces. You can read more about Palisades Playhouse and their future plans from this Post-Gazette article. Tickets are available at the door or online here.